Those who feel strongly about the issue — and there were a lot of those people at the wedding — may want to make a contribution to Equality Florida. 11 months and one week after Brian Feldman married Hannah Miller, a stranger he did not love (and has seen less than ten times since their wedding ceremony), the Honorable Judge Maura T. Smith presides over a final hearing for Brian’s annulment petition. …While Brian and Hannah have fought valiantly for this cause, sacrificing their own personal relationships to do so; the end of this marriage project does not end their support of the cause, nor does it decrease their desire for equal rights for all. In fact, the project itself and the inspiration of the people whose lives have been touched by it have only deepened their commitment to this worthwhile cause. It is the people who are waiting their turn for the right to marry, who are the true heroes and that Brian and Hannah commemorate with this project. Any interested parties are welcome to observe the proceedings. In lieu of annulment gifts, Brian and Hannah ask that you please make a donation to Equality Florida, a statewide education and advocacy organization dedicated to eliminating discrimination based on sexual orientation, race, gender and class. 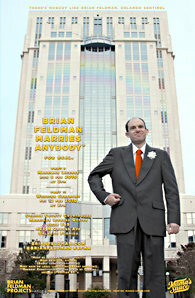 Brian Feldman Projects is Florida’s premiere presenter of experimental time-based art since August 2003. Dinners on stage with real life families, leaping off ladders for 24 hours, bringing attention to the importance of reading in everyday lives, marriage as commentary – this is what we do. Artistic Director Brian Feldman is recipient of the State of Florida’s 2011 Individual Artist Fellowship. Please note, the following items will be prohibited from coming into the courthouse: Firearms, Knives of any type, Handcuffs/handcuff keys, Scissors, Razors, Box cutters, Pepper spray, Aerosol cans, Tools, Tape measures, Clay and/or putty material, Glass perfume bottles over 4 oz., Chains, Oversized belt buckles. Also: No unwrapped foods or drinks are allowed. This entry was posted in Orlando theater, Performance art and tagged brian feldman, Brian Feldman Marries Anybody, Equality Florida, Hannah Miller, Marriage. Bookmark the permalink.